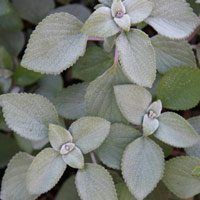 If you are looking for silver or grey foliage plants then some Plectranthus species might be worth considering. The evergreen Plectranthus argentatus also known as the ‘Silver Spur Flower’ or ‘Silver Plectranthus’ (picture right) with its silver grey foliage and a low, shrub like growth habit is one of the most attractive species. Mauve flowers in spring are an added attraction. Another popular variety is Plectranthus ‘Blue spires’ a tough attractive ground covering plant to small bush. With over 300 species in the genus, Plectranthus are found in many parts of the world including Australia, and in our opinion we have some of the best varieties of all. P. apreptus can be found in New South Wales and Queensland, green foliage small blue flowers and foliage that looks like mint. P. parviflorus ‘Blue Spires’ is another native species. Variegated foliage, mid green with creamy yellow margins, blue flowers spike held above in spring. P. nitidus (Nightcap Plectranthus) is a rare and threatened species found in Queensland. All are relatively easy to grow with Plectranthus ‘blue spires’ and P. argentatus or ‘silver plectranthus’ being the most suitable forms for the garden. A well drained soil and full sun to part shade, preferably with some protection from the hot afternoon sun. These plants are easily kept in shape with a little light pruning. Good drainage is the key to growing these plants, in very wet areas raising the garden bed a little will help. P. argentatus is a suitable candidate for container growing, and it also grows well in light shade.